Ontos: "Then—Suddenly—The Viselike Clutch Weakened and Relaxed"
"Then—Suddenly—The Viselike Clutch Weakened and Relaxed"
By J. Lenivers Carew (?-?). 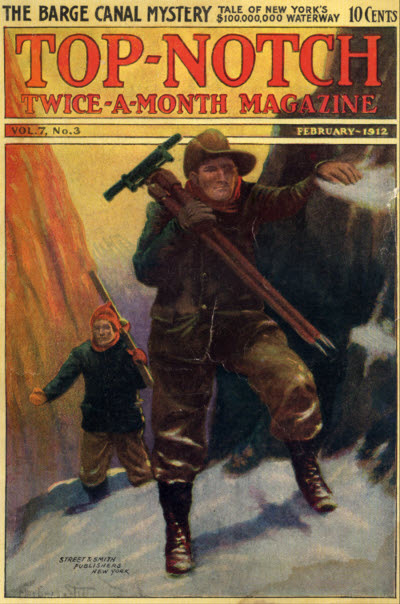 First appearance: Top-Notch Magazine, February 1, 1912. Online at The Pulp Magazine Project (HERE, slow-load PDF; scroll down to page 168). as the prey . . .
"This board never waits for applicants who are not prompt." "You made a mistake. You ignored the fact that a man who has been bought still has a price!" "Hear the bell, Stephen? The bus is going out." "They lied to you, Denzil." "I'm an awful bad feller when I get on the track of a man." "Only you mustn't talk to these fellers—it wouldn't do no good, an' the doctor's a sharp one. You leave him for me to deal with." "What do yer think I am, a doctor?" and all from 1910 to 1915. The bottom line: "I remember the time I was kidnapped and they sent a piece of my finger to my father. He said he wanted more proof." "The Trigger in the Dark"